Since 1921, at the entrance of the sleepy village of Savigny les Beaune resides this lovely family-owned estate. Following vigneron generations before him, Jean-Michel Maurice studied in Beaune and at the University of Beaune before purchasing pre-Phylloxera vineyards in Hautes Côtes de Beaune, now holding 12.5 hectares. With his wife Yvonne and son Stephen (who studied Pinot Noir winemaking in Australia), they are committed to producing wines true to the intrinsic feminine character of Savigny Les Beaune. The appellation is in a shaded valley that means cooler temperatures, longer hang time, lower brix levels and wines with lower alcohol, more delicacy and elegance in style, yet with acidity for graceful aging. 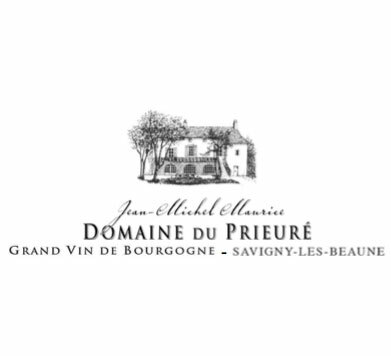 The Prieuré (Abbey) on their label built in 1771 was their winery until building the new one in 1992. Grapes are hand sorted by the family (plus a cousin, uncle and Stephen’s winemaker-girlfriend Lucy), the whites are pressed directly after harvest, the reds de-stemmed. Initially cold soaked, native- yeast fermentation starts naturally with gentle punch- downs, then pump-overs as temperatures rise, limiting extraction. Reds age in 10% to 30% new oak, depending on appellation, are racked after 12 months in 3000 Liter wood fudres, and settled in stainless steel vats before Estate Bottling unfined, course-filtered only if necessary. This Crémant is entirely grown in Savigny Les Beaune from true Champagne varietals of Chardonnay and Pinot Noir. From two steeply sloped, west-facing, rocky parcels with yields under 2 tons/acre, it has 70% Chardonnay, 30% Pinot Noir, 25% Reserve wine, and dosage of 10g/l. 10% is new-oak aged for 10 months, 90% in neutral vessels, and 14 months in tirage before disgorgement. Tasting Notes: “Crisp, racy and lively, a nose of flower petals, nutmeg, earth and cider, flavors of white peach and stone fruits, honey, minerals and toasted nuts.” Remarkable for the price. 500 cases. From three dry- farmed parcels on a steep 25% slope yielding 1-1.9 tons/acre. The 66 year-old vine fruit is aged 15 months in neutral barrels with no ML fermentation; the rest is stainless fermented with cold, slow malo-lactic conversion. No new oak. 400 cases. Because these 34 year old vines are on shallow, rocky soil on a steep 20% slope in the coolest and highest elevation in Savigny (single Vineyard “Les Champons”), it has longer hang time, low yields under 2.25 tons/acre, produces small and concentrated grapes, and is the last Prieuré parcel picked. Named “the place with bad soil,” (the exact same Comblanchien soil as in Chambolle Musigny) the densely spaced, 50 year old vines look down from a steep southwest facing slope 300 feet above the village of Savigny. The cool site produces thinner skins and typically more delicate styling. Grown on a sloping hillside vineyard, these 61 year old vines produce a tiny yield from the gravel and clay based soil. Aged in 20% new French Oak barrels. Only 175 cases made, 45 cases imported to the US. Not fully retired from winemaking, father Jean-Michel has now introduced “Chénas” to their line. Among the most revered Beaujolais Crus (and rarest in the US), low-fertility soils result in small, thick-skinned, concentrated grapes and age-worthy, sturdier Gamay based wines. 40-year-old, close- planted vines on a granitic, sandy and porous hillside slope overlooking Chénas, “goblet” pruned without wires, aged in neutral oak vats and barrels.